This chapter outlines the role of music in well-being for people near the end of life. 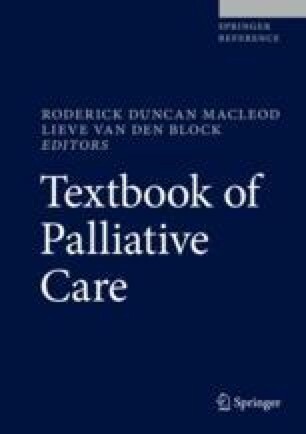 Written for the care professional or member of a multidisciplinary team, this chapter assumes that music engagement and a therapeutic approach to music in palliative care is relevant and accessible for all healthcare professionals, not only specialists or music therapy experts. The information provided here looks at the potential impact of music on pain, agitation, and diversion and for supporting emotional and spiritual life quality. Music is especially useful as a relational tool supporting whole-person care and a good end-of-life experience for the patient and their family and friends. This knowledge can be utilized to provide music, to facilitate therapeutic musicians interacting with a patient, and to increase awareness among staff and patients, and patients’ families regarding the benefits of music in care, in particular, supporting emotional, psychosocial, spiritual, and physical needs not otherwise supported by medical care. Therapeutic music is presented from a historic, scientific, and holistic perspective, including considerations that will assist in cultural sensitivity. Ali Imam A. Website of Islamic scholar Imran Nazar Hosein. http://www.imranhosein.org/faq/59-general/224-is-music-allowed-in-islam.html. Accessed 13 Feb 2016. Bergland C. Why do the songs from your past evoke such vivid memories? Psychology Today HealthProfs.com. 2013. https://www.psychologytoday.com/blog/the-athletes-way/201312/why-do-the-songs-your-past-evoke-such-vivid-memories. Accessed 2 Aug 2016. Bicknell J. Music and pain relief: can music heal the body, as well as the soul? In: Psychology Today 2011. https://www.psychologytoday.com/blog/why-music-moves-us/201111/music-and-pain-relief. Accessed 1 Jun 2017. Cymatics Source (Hans Jenny). https://en.wikipedia.org/wiki/Cymatics. Accessed 5 Sept 2016. Hindu Music. http://www.hinduwisdom.info/Hindu_Music.htm#The%20Antiquity%20of%20Indian%20Music. Accessed 7 Feb 2016. Jenny H. https://en.wikipedia.org/wiki/Cymatics. Accessed 5 Sept 2016. Jutlla K. Person-centred dementia care: promoting cultural competency within existing services. The Association for Dementia Studies. http://www.rcpsych.ac.uk/pdf/MSNAP%20Karan%20Juttla.pdf. Accessed 24 Mar 2016. Mowat H, O’Neill M. Insights: spirituality and ageing – implications for the care and support of older people (evidence summaries to support social services in Scotland). Institute for Research and Innovation in Social Services; 2013. www.iriss.org.uk. The Chalice of Repose. http://chaliceofrepose.org/music-thanatology. Accessed 6 Sept 2016.